HYUNDAI RECEIVED THE 2016 LOWEST 5-YEAR COST TO OWN AWARD FOR OVERALL BRAND ACCORDING TO KELLEY BLUE BOOK’S KBB.COM. For 2016, the Hyundai brand was named a winner of the annual Kelley Blue Book 5-Year Cost to Own Awards, recognizing new vehicles with the lowest projected ownership costs. The annual award takes into consideration depreciation, expected fuel costs, finance and insurance fees, maintenance and repair costs, and state fees. 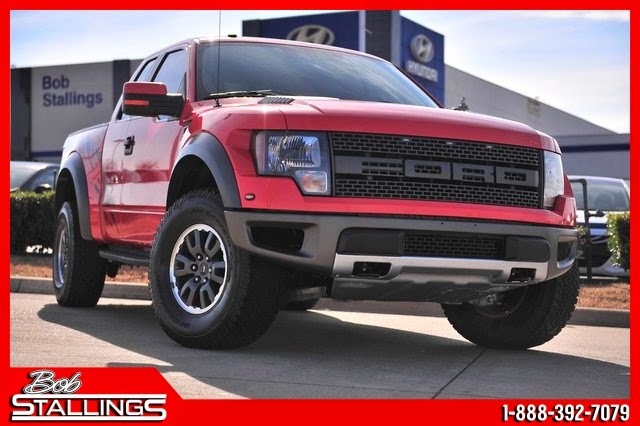 2016 model-year vehicles' projected cost to own for the initial five-year ownership period is based on the average Kelley Blue Book 5-Year Cost to Own data which considers depreciation and costs such as fuel and insurance. For more information, visit www.kbb.com. We will be offering a FREE Oil Change (non-synthetic, any make or model, up to $19.99 value) to any police officer (on his/her personal vehicle) this Friday (9/4) and Saturday (9/5). Learn More about New Hyundai Genesis Coupes in Dallas on our MyDallasHyundai page. Team earns home-state Texas victory from Fogarty’s 24th career pole in inaugural sports car race at Circuit of The Americas. Alex Gurney scores pole position for at the Rolex 24 Hours of Daytona, the inaugural race for the IMSA TUDOR United Sports Car Championship. 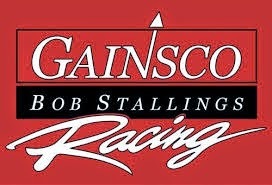 31st pole position for Bob Stallings Racing. 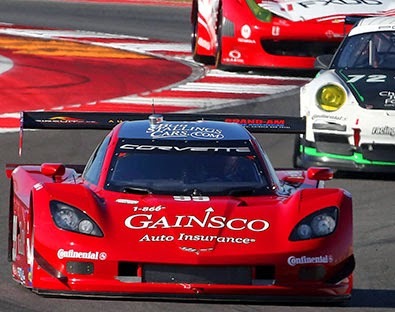 GAINSCO/Bob Stallings Racing announces 2015 racing entry in the Pirelli World Challenge. Jon Fogarty will drive the No. 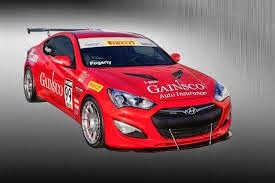 99 GAINSCO Auto Insurance/Hyundai Genesis Coupe in the GTS category. Summer 2015....Bob Stallings Hyundai Can't Wait! Memorial Day is an important opportunity for all Americans to remember the men and women who have given their lives in the defense of our country. I served in the US Navy during the Vietnam War and was very fortunate to have never seen battle, but many of my high school friends lost their lives in defense of our way of life and of my personal opportunity to pursue my own hopes and dreams. I am so grateful for their sacrifice and the sacrifice of their family members. 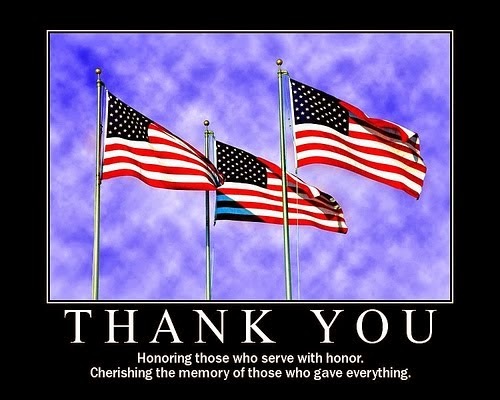 Please take a moment on Memorial Day to think of how we have all benefited from the men and women of the US Military who laid down their lives for our freedom and our way of life. Memorial Day isn’t just a Holiday, it’s a day to honor and remember what they did for us. Please come out and enjoy our Family Fun day event this Saturday May 23 from 11-1. We will have Burgers, Hot Dogs and tons of fun! 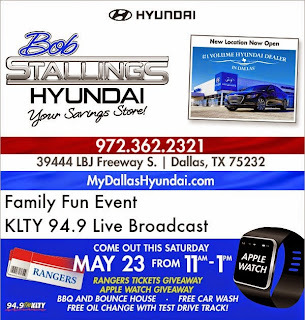 Bounce houses for the kids, free car washes and lots of prizes! 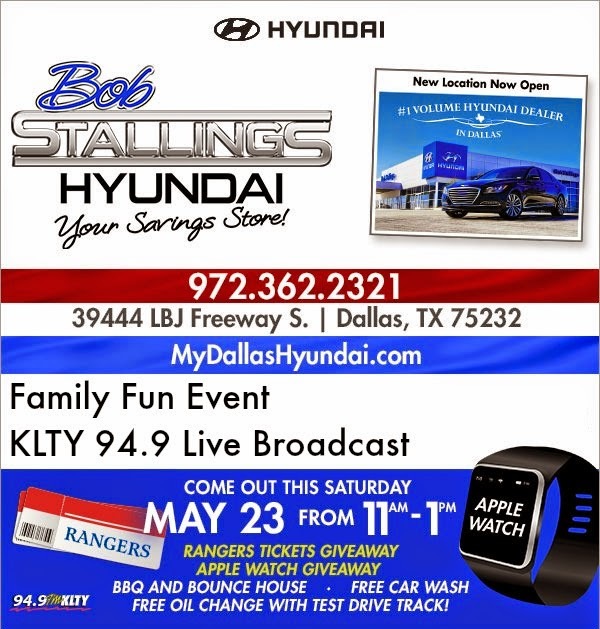 Texas Rangers Tickets, Tickets to CELEBRATE FREEDOM CONCERT, APPLE WATCH GIVEAWAY and more! The moment you’ve waited for is here. But not for much longer. 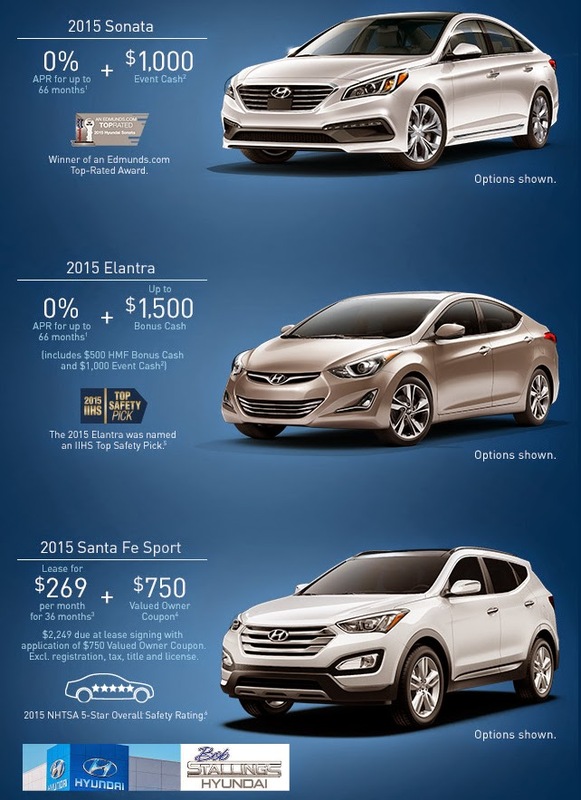 Don’t miss these exceptional offers on the stunning Sonata, the extraordinary Elantra and the versatile Santa Fe Sport near Arlington. 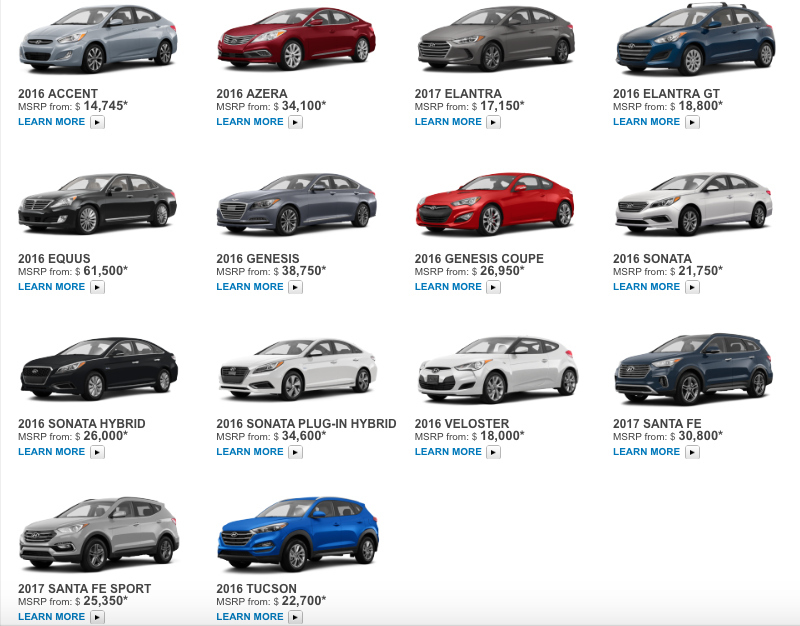 Hurry into Hyundai before the moment’s gone. 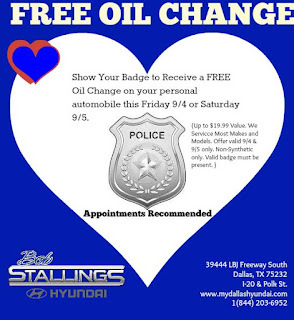 Visit your Dallas Hyundai source Bob Stallings Hyundai. 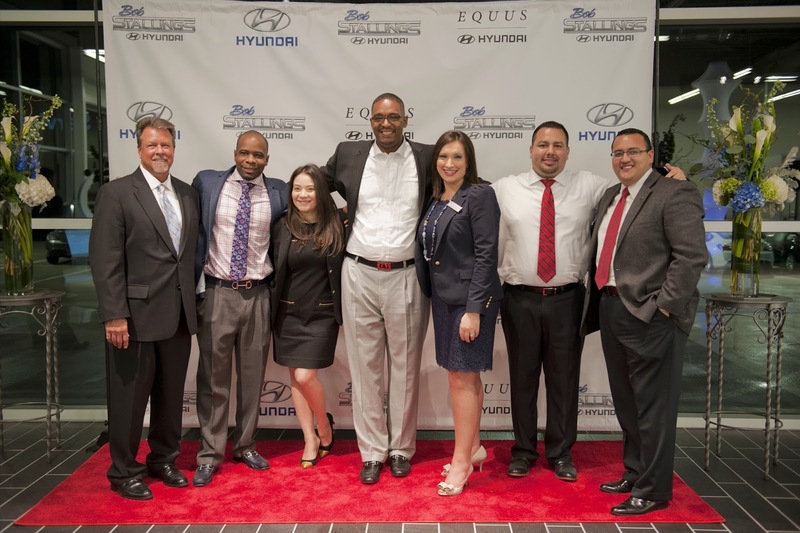 The Bob Stallings Hyundai Executive Grand Opening was a huge success. We are certainly ready to serve our customers coming from anywhere in the Dallas Metroplex. The Chambers of Commerce from DeSoto and Cedar Hill were on site alongside many other business executives and media. Bob Stallings Hyundai was honored with an award from Wells Fargo Dealer Services as we became a Platinum Dealer with Wells Fargo. Our clients have found many affordable financing options with Wells Fargo Bank and we are happy to continue to offer Wells Fargo Auto Loans. Many Members of the Dallas Korean Chamber were on site to celebrate with us. 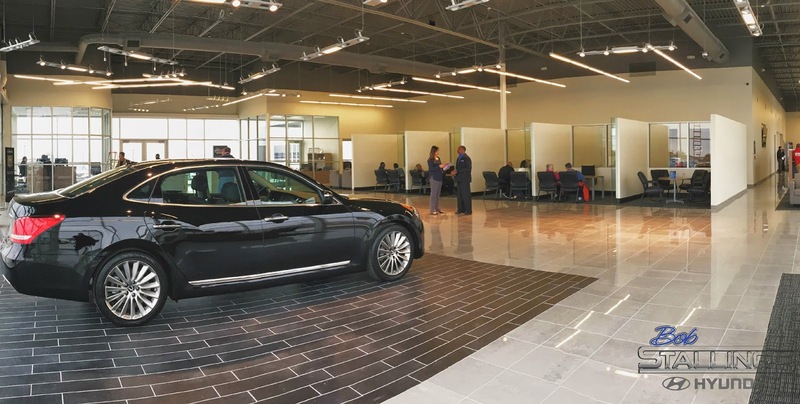 Our modern and sophisticated Hyundai dealership is sure to attract the many business leaders with in the Korean community in Dallas. 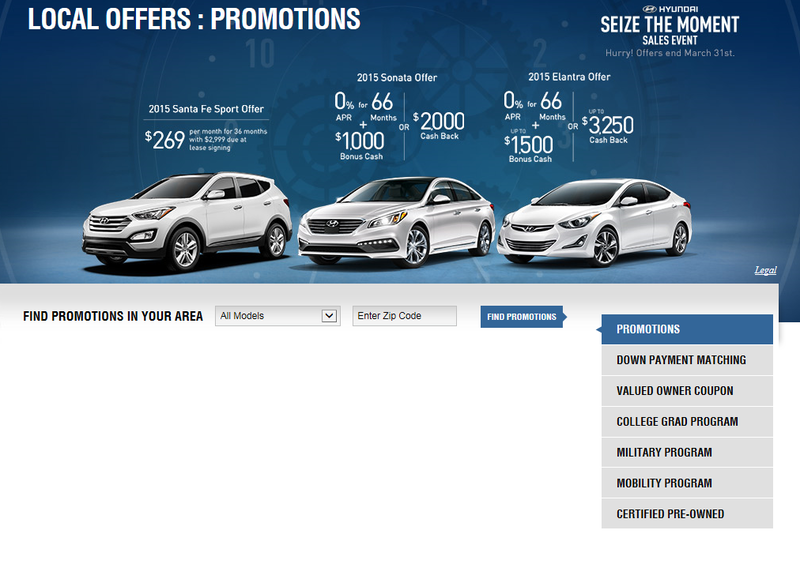 And just in time, Hyundai Motor Financial announces 0% on new 2015 Hyundai Sonata and 2015 Hyundai Elantra. We are your Savings Store! www.MyDallasHyundai.com has all of the details for you! Our Dealer Principal, Bob Stallings, will be bringing his business expertise, values and leadership to Hyundai North America's Dealer Council. Elected by their peers, the National Dealer Council serves as advisors to the corporate executive management of Hyundai North America. 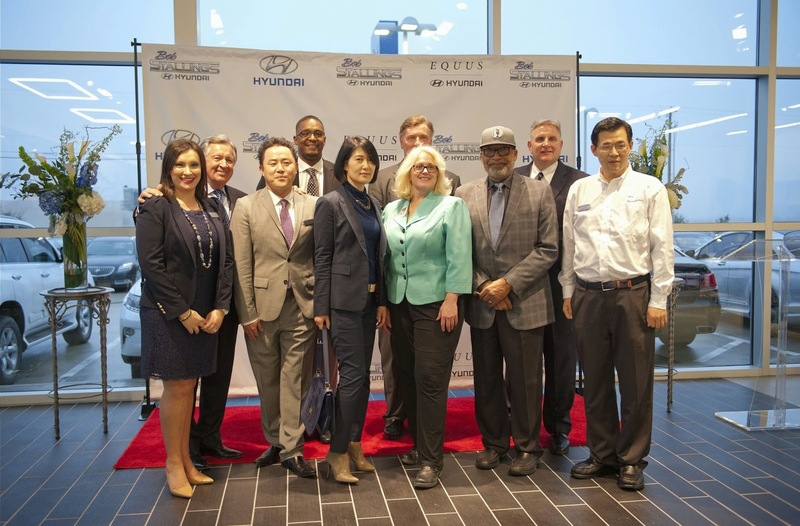 The group meets once per quarter alongside North American and Korean executives from Hyundai to discuss the successes, challenges and opportunities for Hyundai Dealers in the United States. Bob states that he is excited to also visit South Korea to learn about the new initiatives that Hyundai will be rolling out to North American Dealers. 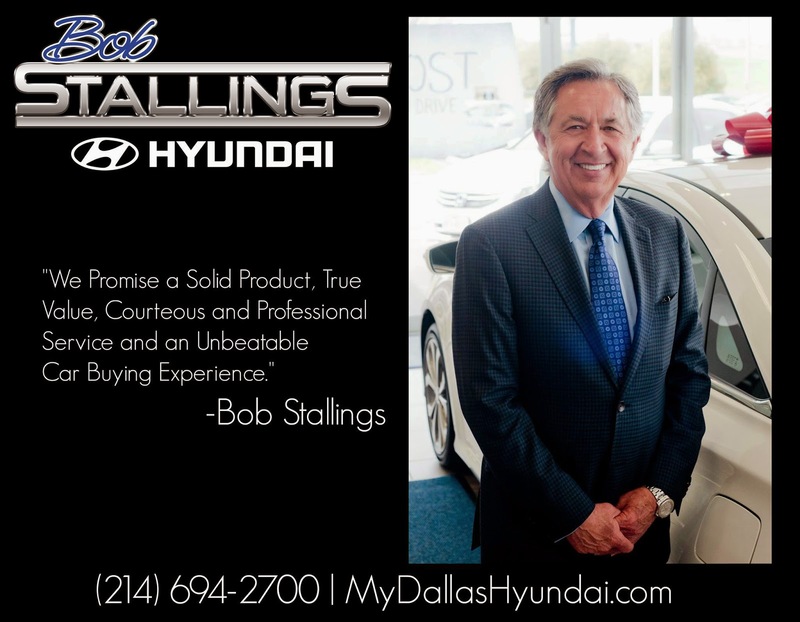 Bob Stallings Hyundai, close to Downtown, is the #1 Volume Hyundai Dealer in Dallas. 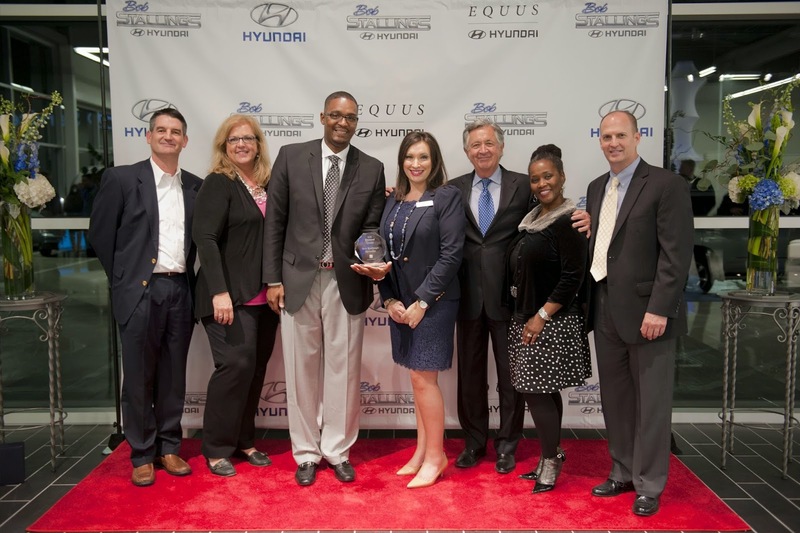 Recent accolades of our new car dealership include the appointment of becoming a Hyundai Equus Dealer in 2014, #1 in Customer Satisfaction in the SC Region in our Service Department in Q4 2014, #1 in the United States for Production and Vehicle Protection Facilitation with Hyundai Motor Financial, #1 Hyundai Azera Dealer in the US (for certain months) and most recently we have achieved the #1 Customer Service score in the SC Region for Customer Satisfaction in Sales. Visit our 28,000 sq. foot Hyundai Dealership, sitting on 7 acres in Dallas today to view a wide selection of New Hyundais and Pre-Owned Vehicles including our Truck Center. We are easy to get to from anywhere in the DFW Metroplex, Arlington and Irving. Find us at 39444 LBJ Freeway South at I-20 and South Hampton.